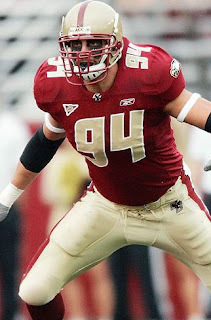 Boston College linebacker Mark Herzlich is a first team All-American. He was ACC defensive player of the year, a finalist for the Butkus award, both as a junior. And he was predicted to be a top 5 pick in next year's draft. A player who, you could just tell, loved the game and played it with a passion—his warrior facepaint just one clue—was destined for great things. Again, you could just tell. Well, all that was taken with 3 words Herzlich uttered yesterday. "I have cancer." In what world—where a guy like Herzlich, who's been nothing but a warrior on the field, and a good guy and teammate off the field, is diagnosed with cancer at 21—is this fair? Not that cancer for anyone at any age is fair. That said, when an athlete with the kind of potential Herzlich flashed, and who played the game with the kind of joy and intensity you want to see in a player, its a special kind of sadness when he struck down. You feel robbed of what he could have accomplished on the field. What he could have done. The only word that comes to mind, is unfair. Football aside—it should be the least of mark Herzlich's concerns right now—AAPTBNL wishes Mark a speedy recovery and complete and clean bill of health soon. Get well, Mark. And we hope to see you intimidating running backs and tight ends very, very soon. Great post, and really quite sad. This one the same day that the great Wayman Tisdale passes away at the age of 44 of cancer.